Q Acoustics 2010i review | What Hi-Fi? If you’re looking for a small, high-quality pair of budget speakers, meet the 2010is. There wasn’t a whole lot wrong with the much–liked 2010s; nevertheless, the boffins at Q Acoustics decided they could do better. They’re not wrong. The ‘i’ version has a new tweeter, uprated mid/bass driver cone and revised crossover to accommodate the changes. That new tweeter is now decoupled from the cabinet to minimise possible ill-effects from any vibrations caused by the mid/bass driver. The cabinet remains unchanged with the exception of the new front-panel trim; considering how nicely made the enclosure is, that’s not a problem. Connection is done through a pair of neatly designed single-wired terminals on the bottom panel. These speakers sound a lot like their bigger brothers, the Award-winning 2020is – no real surprise when you consider their shared engineering content. There’s the same combination of refinement and increased level of attack, and a similar degree of insight into recordings. 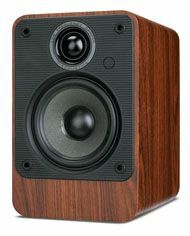 Not surprisingly, the larger speaker pulls ahead when it comes to scale, dynamic authority and outright bass extension. Still, at this price and size level there’s little around that can worry the 2010is. They’ll work quite happily at the end of a Denon D-M38 micro system, but if you stretch your budget to the likes of Marantz’s 6004 CD/amplifier combination you’ll find these speakers deliver a brilliant performance for the money. Few rivals sound so composed and detailed yet – thanks to a beautifully judged and refined balance – remain so unfussy about partnering equipment. The original 2010 was a terrific speaker for the money. This ‘i’ version is even better.